Each channel of the EXC-1553PCMCIA/Px operates simultaneously as a Bus controller and/or multiple (up to 32) Remote Terminals, or as a Triggerable Bus Monitor. The card supports error injection and detection. The card’s small size and compatibility with notebook computers make it the perfect solution for performing system simulation of the MIL-STD-1553 bus, in the lab and in the field. Each channel of the EXC-1553PCMCIA/PxS operates either as a Bus Controller, Remote Terminal, or Bus Monitor. 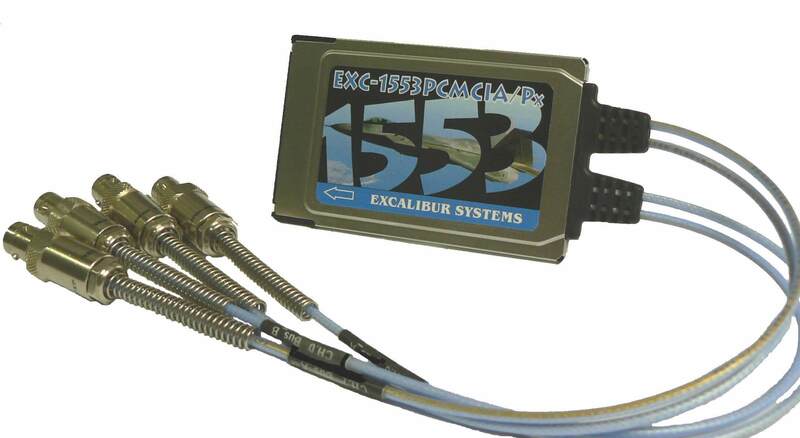 The EXC-1553PCMCIA/Px and EXC-1553PCMCIA/PxS cards are supplied with C drivers, including source code, Merlin+ Windows software and may be used with Exalt, Excalibur’s Analysis and Laboratory Tools, a Windows monitoring application. The PxS card is NOT compatible to the EXC-1553PCMCIA/B card. All Excalibur PCMCIA boards support PCMCIA release 2.1 which is a 16 bit version of the spec. Check that your PCMCIA slot supports 16 bit operation. The EXC-1553PCMCIA/P1 card was developed to replace the EXC-1553PCMCIA/EP card. An application written for the PCMCIA/EP will run on the PCMCIA/Px with the new DLL. All the functions in our DLL are supported in the new version of the card, transparently. There is new functionality available on the new card. EXC-1553PCMCIA/P1-R Single channel 1553 PCMCIA Type II MIL-STD-1553 multi function interface card for PCMCIA compatible notebooks with ruggedized, hard-wired cable connection. EXC-1553PCMCIA/P2-R Dual channel 1553 PCMCIA Type II MIL-STD-1553 multi function interface card for PCMCIA compatible notebooks with ruggedized, hard-wired cable connection. EXC-1553PCMCIA/P1S-R Single channel 1553 PCMCIA Type II MIL-STD-1553 single function interface card for PCMCIA compatible notebooks with ruggedized, hard-wired cable connection. EXC-1553PCMCIA/P2S-R Dual channel 1553 PCMCIA Type II MIL-STD-1553 single function interface card for PCMCIA compatible notebooks with ruggedized, hard-wired cable connection.